Actually, I don’t so much lose things as misplace them, whether under a couch cushion, in a jacket pocket, or deep in a backpack I never venture into. It’s almost daily, the search for car keys, my smartphone, wallet, or a variety of other important items. This is where devices like Chipolo, TrackR Bravo, Tile and Wuvo come into play. Each small tracking device connects to a smartphone or tablet over low-power Bluetooth, lasting in some cases over a year on the same battery. Their usefulness is derived from being able to put them somewhere — on a keychain, in a wallet or bag — that is tracked through a smartphone app. But all of these products have strengths, weaknesses and, more importantly, problems. Which one is right for you? The TrackR Bravo is a solid choice if you’re an iPhone user, but offers an underwhelming experience with Android devices. Despite the fact that the device’s feature set says it’s compatible with all Android smartphones, it actually isn’t. With the TrackR Bravo, unless the lockscreen of the Android device is disabled, repeated requests to setup Bluetooth Smart Connections are sent out. If multiple TrackRs are connected to one smartphone, the number of requests increases considerably. At one point, I woke up with 30 to 40 TrackR Bluetooth notifications sitting in my Nexus 6P’s drop-down menu. Accepting the Bluetooth Smart Connection doesn’t solve this problem, at least not for me (TrackR suggests you do this in the FAQ on its website). Users of various online forums also claim they have been able to circumvent the issue by simply setting up TrackR Bravo as a trusted Bluetooth connection. With both my Nexus 6P and HTC M9, this fix didn’t work. Adding more to this issue, the repeated connection requests eventually caused the batteries in my two TrackR Bravo devices to die after just a few days of use, and depleted my Nexus 6P’s power as well. It’s important to point out, however, that this problem is not only TrackR’s fault, but also Google’s. TrackR claims that it has reached out to Google about the issue, which it says is related to Android, and has reportedly yet to receive a response. But despite this problem, TrackR Bravo offers some of the top tracking features around when compared to its competitors, especially if you’re an iOS user. During my time using TrackR Bravo with the iPhone 6s Plus, I ran into few issues. 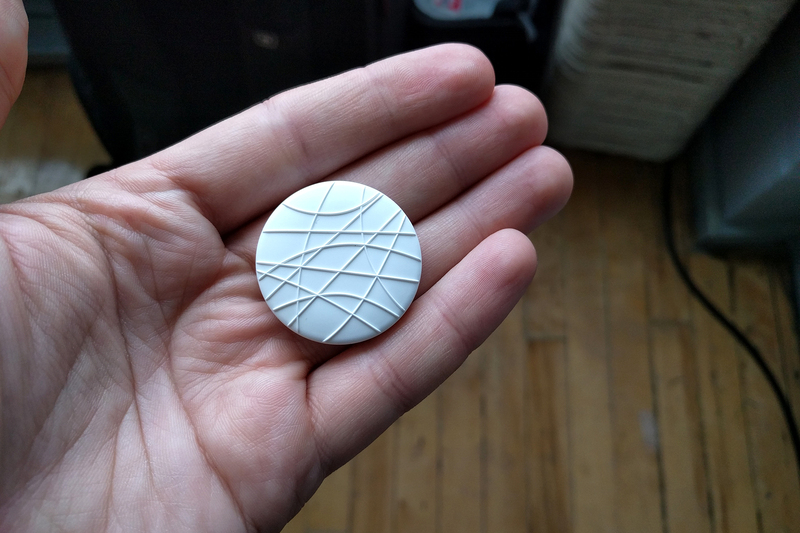 TrackR Bravo is by far the sleekest tracking device I tested out, and is considerably smaller than both the Chipolo and Tile, measuring in at 31mm in diameter and 3.5mm thick. This results in it being easier to slide into smaller spaces, like a wallet, for example. However, unlike its plastic competitors, TrackR Bravo’s aluminum frame is easily dented and bent, especially when sharing the same space as loose change in a pocket. These bends can sometimes cause TrackR’s alarm, which is already quieter than either Tile’s or Chipolo’s, to stop emitting sound at all (this happened to one of my test units). What TrackR Bravo lacks in build quality, it makes up in features. Since TrackR is arguably the most popular tracking device I tested out, it’s likely at least someone in your area also owns one, especially if you live in a large city. This means that crowdsourced tracking, which updates your device’s GPS location when another TrackR is nearby, is significantly more effective. TrackR Bravo also supports Separation Alerts, which allows users to set up a notification to sound off when a TrackR is separated from a smartphone. For people who have accidentally left their smartphone at work, or worse, on the bus, this will be a useful feature. 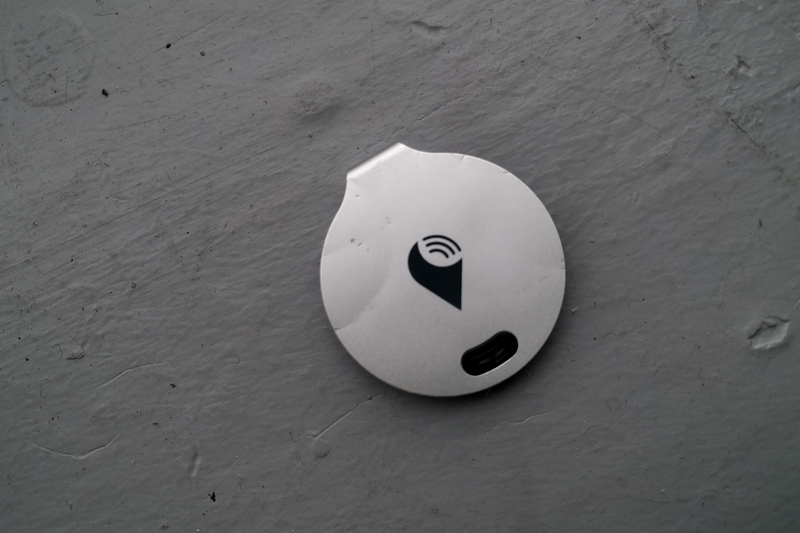 Likely due to its smaller Bluetooth antenna, TrackR’s total range measures in at somewhere between 7 and 12 metres, making it considerably shorter than other tracking devices I used. A three-pack of TrackR Bravos costs $79.99, while a single unit costs $39.99. TrackR sells a waterproof case for the Bravo, as well as the TrackR Sticker, a plastic version of the Bravo, and the TrackR Wallet, a tracking device designed specifically to slide into wallets. Originally funded on Kickstarter, Chipolo, developed in Slovenia by startups Geartronik and Nollie Apps, is the tracking device that surprised me the most, especially since it’s the first product from two unknown new companies. 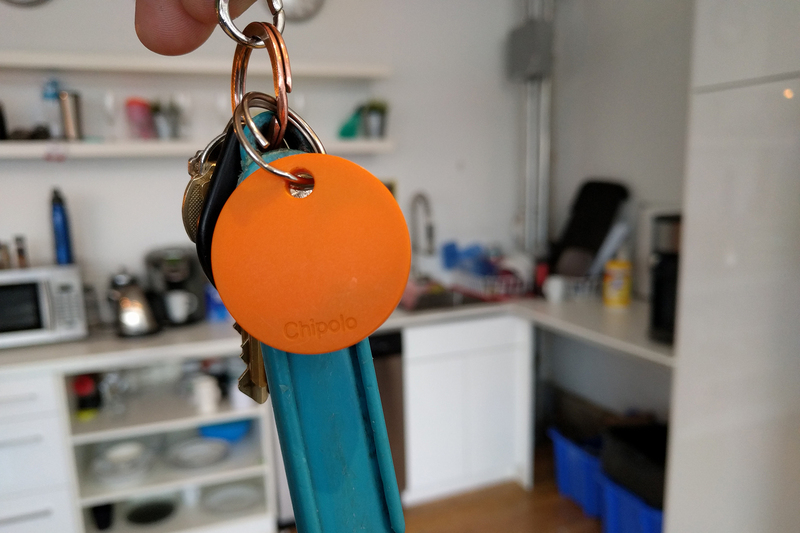 Chipolo’s plastic build quality is on par with Tile’s or TrackR’s, but it also comes in bright colours, making it easy to spot on a keychain or when buried deep in the recesses of a backpack. What sets Chipolo apart is that it’s exceedingly reliable, as well as its ability to locate the smartphone it’s connected to. If the Chipolo is shaken, the smartphone it’s paired to emits a tone, giving the device a dual purpose (TrackR includes similar functionality, but I found the feature unreliable). Chipolo offers 60-meter signal strength, which makes it ideal for use both indoors and out. When it is out of range, a notification appears, letting users know the Chipolo and its associated smartphone have separated. The European-manufactured device does have downsides though. Unlike both TrackR and Tile, Chipolo doesn’t have crowdsourced tracking. This means that only the last known GPS location is available when looking at Chipolo’s in-app map. If you’ve completely lost your smartphone and are unsure the area it’s located in, this limitation renders Chipolo useless. The startups behind Chipolo reportedly have plans to launch a crowdsourced network similar to TrackR’s, Tile’s, and Wuvo’s, but hasn’t yet revealed a launch date. The sound Chipolo emits when activated is also more audible than either Tile or TrackR. Chipolo is supported by both iOS and Android and when testing the device out on both operating systems, I didn’t run into any difficulties. Unlike every other tracking device featured in this story, Chipolo also comes with an extra battery. Chipolo is priced at approximately $40 Canadian (€24). 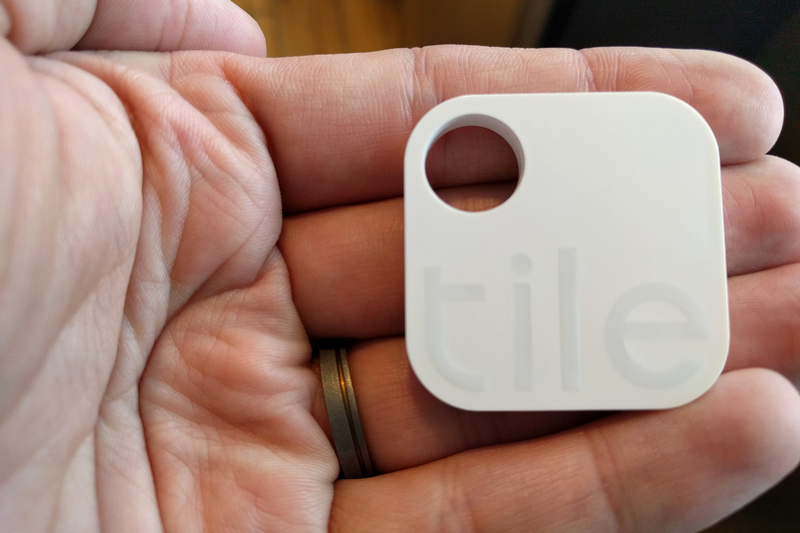 Tile, another tracking device crowdfunded back in 2013 by thousands of backers, has the most interesting, and useful, design of the four trackers in this story. The unique hole in its plastic body means it fits perfectly onto a keychain or lanyard of any size (Chipolo also has a space, but it’s considerably smaller). While Tile is a tad thick, like Chipolo it’s very durable. Unlike TrackR, I didn’t worry about it falling apart and being dented when attached to my keychain, or accidentally falling on the ground. 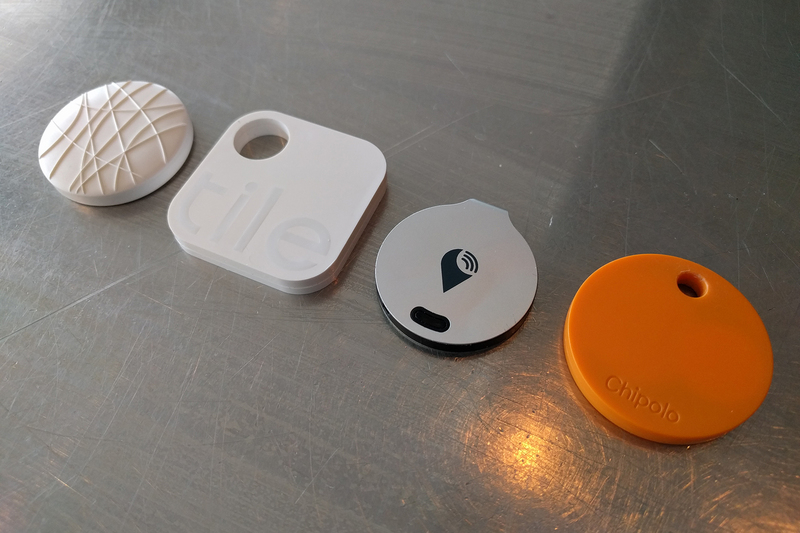 In many ways, Tile’s functionality is nearly identical to Chipolo’s, right down to its feature set, though unlike its Slovenian-made brother, Tile features a Community Find feature, that works very similarly to TrackR’s. If the Tile is out of Bluetooth range, it relies on other Tile users to locate the missing device. Just like TrackR, to make the feature useful, people in the surrounding area need to be using Tile, too. In my experience, similar to TrackR, crowdsourced finding is hit or miss; in some cases I’d easily locate the beacon, and in others, it failed to connect. However, Tile’s range is roughly 30 metres, half of Chipolo’s range. The sound Tile emits is also loud enough to hear from a distance, just like Chipolo’s. But here’s where things start to go south. Since Tile is completely waterproof, there’s no way to replace its built-in battery. When the tracking device’s battery dies, which can reportedly take somewhere between eight months and a year, your only option is to purchase a new one. The company, however, does offer a ‘ReTile’ replacement program that allows users to send in their device for a heavily discounted replacement. All older Tile hardware is then recycled. Four Tiles cost $89.99 and one Tile is priced at $29.99. Wuvo is an interesting device because, on paper, it’s nearly identical to Trackr, Chipolo and Tile. The Wuvo is reliable, and emits a tone load enough to hear from a considerable distance. I also ran into few issues when using the Wuvo with both iOS and Android. Where the Wuvo lags behind the competition is build quality. Unlike the solid construction featured on Chipolo and Tile, Wuvo feels like if enough pressure is applied to its body, its plastic shell might snap. Furthermore, attaching the included key ring is more difficult than other tracking devices featured in this story, because it’s located within an indent on the edge of the Wuvo. But what makes Wuvo stand out from the pack is the unique ID code printed on its rear. If someone happens to find the item Wuvo is attached to, all they need to do is navigate to found.wuvo.com and fill out a form. The finder’s info is then sent to your device via a notification. While this sounds great in theory, it’s unlikely most Wuvo users will ever get their hands on their lost item again. Wuvo’s range measures in at 30 metres, and similar to other trackers featured in this story, the device supports crowdsourced discovery, though the feature is dependent on other people in the area also owning Wuvos. It also features removable batteries. It’s worth noting that Wuvo’s Android app strangely always appears in the smartphone’s notification tray. It can be closed and relaunched when you actually want to use the Wuvo. One Wuvo Spot is priced at $29.99 USD (about $42 CAD) and three are priced at $84.95 USD ($118 CAD). This is a difficult question to answer, especially given all four tracking devices have similar feature sets. After spending multiple weeks with TrackR, Chipolo, Tile and Wuvo, and testing each device out on both Android and iOS, I’ve come to the conclusion that Chipolo is the best, and my favourite tracking device. It lacks the crowdsourced tracking capabilities of TrackR, Tile and Wuvo, but in my experience, is the most reliable of the trackers I tested. If I lose a device, it’s likely either at the office or somewhere immediately nearby, making Chipolo’s extended Bluetooth range a valuable feature for me. 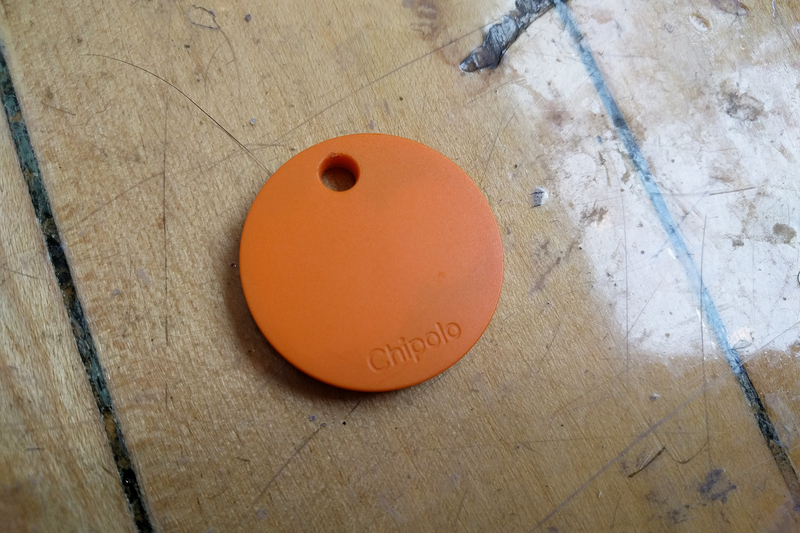 Chipolo’s bright, orange, durable body and 60 metre range, make it far more useful than either TrackR, Tile or Wuvo.